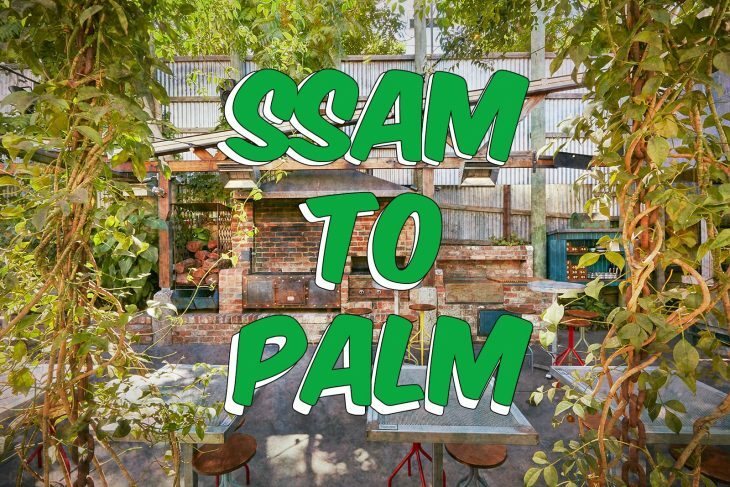 We’re giving away two places at the head of the Ssam to Palm communal table, goblets of natural wine to swill and a fresh Ssam spread to feast on. It’s a prize so regal, guests will be laying gifts at your feet. We’re pretty good at eating and drinking. We’re the kind that will opt-in for matched wine, and order cocktails in-between courses, and have no problems eating cheese pre-entree. There’s no cheese at our Melbourne Food and Wine Festival communal dining event but we’re doing what we do best in the beer-garden, on what might be the last decent evening this month. Long tables in the beery, magnums of natural wine by the pour, a cute lantern or two and a kitchen slicing and grilling over the barbie – the garden will be set for a cuisine dedicated to freshly wrapped parcels of mince and vegetable leaf, best shared and eaten with your hands. Put the word out, and you could win dinner for two with all the frills at our Ssam to Palm MFWF event on March 22. We’ll treat you like we treat ourselves: a three-course dinner for two (with extra trimmings), bottomless matched wine, and a couple of cocktails to keep you busy. Entries close Saturday 17 March, 10pm. Don’t like suspense? Tickets can be bought via the MFWF website. – Prize includes two tickets to Ssam to Palm at Dr Morse for MFWF, 3-course meal, plus matched wine and two cocktails per person and is valued at approximately $300.